San Mateo residents are complaining of running water shortages, mostly periodic low water pressure that has forced them to fill buckets, bins, and bottles for backup. 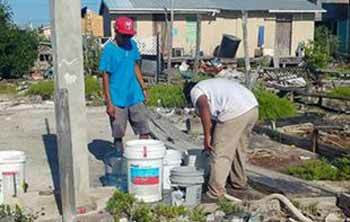 Belize Water Services (BWS), the island’s water service provider, has indicated that the issue is temporary and attributes the cause to an increase in demand of the customer service water line feeding San Mateo. The line can no longer provide the necessary water pressure for the number of people living in that area. According to company personnel, the water line is being upgraded and it is due to such works that the supply of water to the said subdivision has been affected. Residents say that for over a week, water flow fluctuates during certain hours of the day and even at night. In some areas, the water cuts off completely. BWS explains that this occurs when their ground personnel is working on the uplifting of the water line supplying water to San Mateo. The project is being done in phases, and as each one is complete, works move forward to the next area where an upgrade is needed. It is estimated that the project will take around a year to a year and a half. The water company further explained that the problem is not isolated to San Mateo only, but in fact to the entire island. According to them, the increase in population and the tourism high season is affecting the way water is distributed around San Pedro Town. BWS states that their main water supplier, Consolidated Water in southern San Pedro, can only produce a certain amount of potable water. They believe that the current consumption of water exceeds the amount being produced.